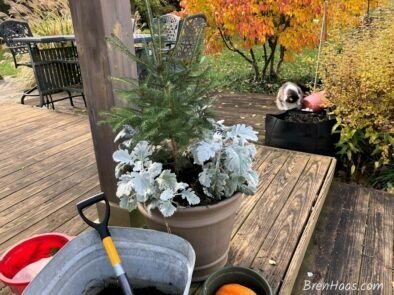 In this post learn how to pot up a conifer starter plant that will be on display until it is time to transplant in the landscape. I will share with you some of my favorite products that will make this project a success. My fur babies and I had a great time creating this video to share with you. Take a look at how easy it is to plant up a conifer starter plant. 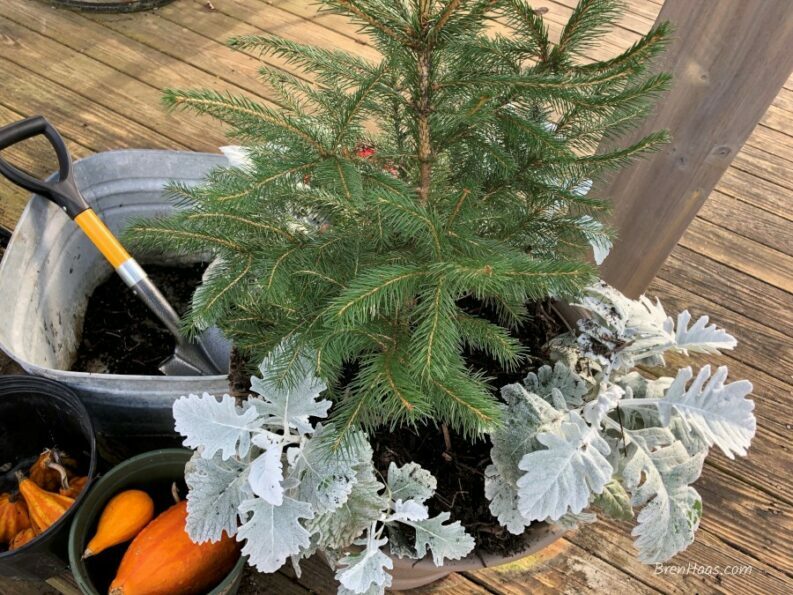 If you don’t have a conifer starter plant I share where you can find some to grow for your landscape and container designs. This video is on my Bren Haas YouTube Channel. Please consider subscribing to it to see extra videos I create. Don’t forget to leave a comment on this post telling me what you thought of this video. I love saying the word ‘conifer’ so I end up referring to most all my evergreens as that. 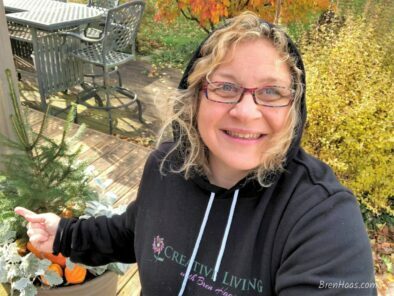 A conifer is “a tree that bears cones and evergreen needle-like” In order to put this video together I used one of the American arborvitae plants that I started from a starter. I mention in the video how I purchase these from our local Soil and Water Conservation District. I share more about my planting of these starter trees on my website at the Tree Project. What a great time cleaning up the deck for Autumn. In these photos, I share a few extra tips and details on how to do this project. Mini Shovel to remove the cannas that were growing all summer long. Some of the products mentioned in this post are listed below. Direct addiction questions to me on my contact page featured on this website. [eafl id=”30977″ name=”Centurion Garden and Outdoor Living 168 Round Point Folding Shovel” text=”Centurion Folding Shovel “] – I give this product 5 stars! I am a huge fan of Pinterest! I’d love it if you connected with me other there at @BrenHaas. Start by pinning this image below into your favorite board. Come to join me on the deck overlooking the pond sometime! In conclusion of this video, I would love to hear what you think about the design. Share with me on the social media links provided on this post or contact me.